Henry Cavill's mustache was a curse for Justice League, but it has now been used for a good cause. Paramount Pictures has announced that they have made a donation to the Movember movement in honor of Cavill's mustache from Mission: Impossible - Fallout, bringing awareness to men's health. The studio made a humorous video to make the announcement, which shows the different angles of the controversial mustache in action with some delicate music underneath. Not only is it a funny nod to the mustache, but it's also promoting a great cause. Henry Cavill had finished shooting Justice League when he started filming Mission: Impossible 6, which he had to grow out a mustache for. After Zack Snyder left the DCEU project, Joss Whedon was brought on board to oversee extensive reshoots that brought Cavill back to play Superman. Except this time he had a mustache that Paramount would not let him shave off, so Warner Bros. and DC Films had to digitally remove Superman's mustache in post-production, making it look pretty silly. The mustache really took on a life of its own after that and it's something that Henry Cavill has joked about frequently in the past. Back in March of this year, he posted a video of himself finally shaving it off, which made some fans pretty happy. Justice League went on to become the lowest grossing movie in the DCEU, while Mission: Impossible 6 was a box office success, earning $100 million more than the previous installments. 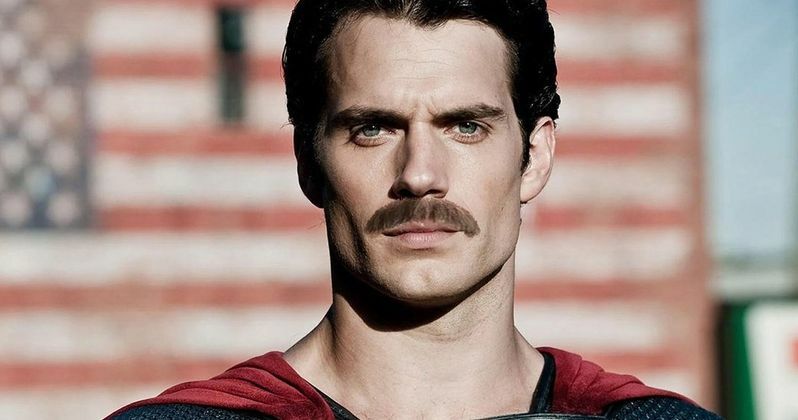 Obviously, Cavill's mustache wasn't the reason why Justice League failed at the box office, but it was just one extra thing for fans to poke fun at. Movember is an annual event where men grow mustaches during the month of November to raise awareness for men's health issues, such as prostate cancer, testicular cancer, and men's suicide. The idea behind the event is to "change the face of men's health." The Movember movement started back in 1999 and has gotten bigger with every passing year, increasing early cancer detection, increasing diagnosis and effective treatments, and reducing the number of preventable deaths. Though it started in 1999, it wasn't until 2004 that the movement started to gather momentum. The fact that Paramount Pictures and Henry Cavill are willing to have some fun with the infamous mustache is pretty awesome. Some might say that it's turning something negative into a positive, while others will claim that there wasn't really anything there to be offended by in the first place, but that's all beside the point. The mustache has been reclaimed by something even more important, which is bringing awareness to men's health. Hopefully, the studio makes this an annual donation and Warner Bros. gets on board to match the donation as well. For now, you can watch Henry Cavill's mustache in all of its glory and then watch him shave it below, thanks to the Mission: Impossible Twitter account.